Sam Locke, recent winner of the Scottish Amateur Championship at Prestwick, is delighted to accept honorary membership of Banchory Golf Club where he was junior champion in 2015. 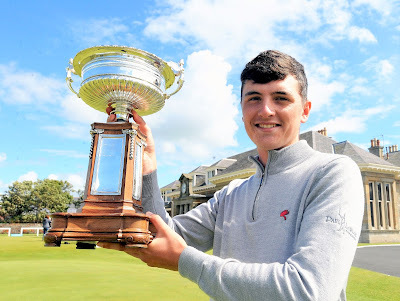 "Sam’s win in the Scottish Amateur Championship is a fantastic achievement at just 18 years of age. "Banchory Golf Club was fortunate to have Sam as a junior member for a number of years. He was our junior champion in 2015 and was also an integral part of our successful men's team, who won the Aberdeen Pennant League in 2015. Having played a few matches with Sam myself, you could always see his potential to go on and do great things in the game. "Sam will join the other elite members on the wall of honour at Banchory Golf Club, which includes Harry Bannerman, Paul Lawrie, Greig Hutcheon and James Byrne. We are all so proud of him for this wonderful achievement."